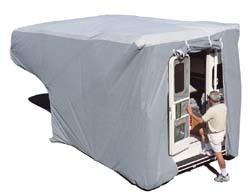 SFS AquaShed® travel trailer covers are great for high moisture climates. Provides triple the protection compared to standard covers. Polypropylene sides ensure maximum breathability and virtually eliminate mold and mildew. Triple layer top panel beads water on contact to resist high humidity and rainfall, plus protect against UV rays. Strap and buckle attachments prevent billowing in windy locations. Reinforced, elasticized corners resist tears and snags. Includes a storage bag and an easy access door with heavy-duty zippers. 104" wide. 2 year warranty. 1 per box.